What is this about Felicity and time travel? I never saw the end of the series, but now I'm kind of curious. Thank goodness for Netflix! I watched Felicity last year on Netflix, and honestly I'm still peeved about all of that time travel business. it was so incredibly confusing! and unnecessary! and I'm pretty much pretending it didn't happen. just like (spoiler alert?) her decision to return to being pre-med at the very end of the series. someone so wishy-washy about the whole idea should not be studying to become a doctor! Do you like The Americans? I've been meaning to check it out, but keep forgetting. Boldly moving past all the things I could comment on bullet point by bullet point, I'm just going to say this: long haired cats freak me out. And feral long hairs? I'd be locking the doors and barring the windows. And hoping Fifty has a puppy Hulk in him somewhere to protect the fort. I was also a religious Felicity watcher, but I somehow missed the whole time travel thing. Which is ok by me. I think I stopped watching when she cut her hair - I felt she cut off her mojo. I am so jealous that you have a gaggle of cats just hanging around your house!! This crazy cat lady would love that! 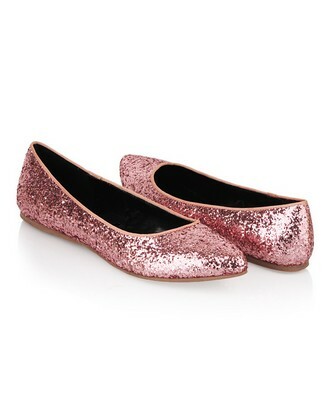 what i would do for those pink glitter flats..
Yay! Kitty love on the LPV!!! This is normally a puppy zone so I'm happy to see some feline friends hanging out! I want to steal them all!! Did someone say pink glitter? I LOVE those glitter flats. So perfect for spring. Don't tell me there's a Forever 21 in the LPV? Well if there is one, it'll be perfect for the LPV Fashion Week. I've recruited Kale Project Kristen to help out too! Hahaha! Enjoy your down time because once spring arrives you'll have to keep up with all of your adventures! I am so so sorry to hear about Salem! This is so sad! Losing furry friends (and family members) is so terrible! Wow, you have a lot of vacations planned! Awesome! And I never watched Felicity either. I don't know but I completely missed that. Cool pumps! Your upcoming plans sound fun, you must be planning a good evening for Saint Patrick's this weekend? Resting for barbecue season ... did it stop, we Barbecued in the snow last night LOL!! It's so hard loosing pets. We lost three while overseas. They are part of the family. Sara, you must check out today's post on Cuddle Buggin. And the opening video will make you smile. My fingers are still crossed for your giveaway ;) Hoping I can be rocking my LPV shirt! Those shoes are fabulous and so are you. Ahh, I want to be in Europe for St. Pat's! I'll have to do my best celebrating state side with TONS of Guinness and debauchery (I'm so classy, I know). Oh my word, a gypsy pilgrimage?! And I just read the other gyspy post, and I can not get over the nonchalant way your husband told you he almost married a gypsy. That's hilarious! I wish he had bought a caravan...I bet that would have been an adventure!